I just went over some old pics and noticed I never officially posted this one, so here it is. Nicely organized Sharon. You certainly have an ample supply of them. I can’t tell from the photo…what’s with the the two stray blue ones? Not enough room? Different length? That looks great. Maybe it will inspire me to make some changes to my clamp storage. 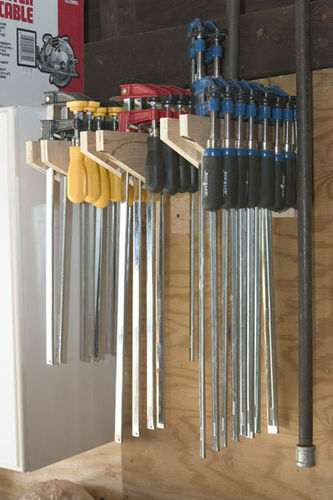 Having the clamps coming “out” from the wall instead of across the wall seems like a smart way to save some wall space. Is that how you see it?? I have only seen a very few racks built “out” from the wall like you have done. Perhaps I also should make some clamp order. How many clamps do one need? That’s one nifty storage and it does seem more well organized than hanging them onto bars.